A million years before modern humans (Homo sapiens) inhabited present-day Catalonia, this northeastern part of the Iberian Peninsula was home to communities of hominins who shared the landscape with other large fauna such as mammoth, hippopotamus, rhinoceros, as well as carnivores such as hyena, jaguar, and wolf. 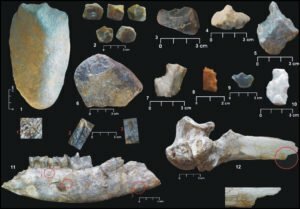 Compared to later periods of prehistory, we have only small glimpses of these hominin communities, with the evidence consisting of a handful of sites in Catalonia with stone tools and animal remains. As well as in Catalonia, other areas of the Iberian Peninsula were inhabited from around 1 million years ago, at sites such as Cueva Negra, Barranco León, and Fuente Nueva in the south, and Atapuerca in the north. These hominin communities (which were Homo antecessor) used a relatively simple and homogenous tool kit that falls in the category of an Early Mode 1 technology. The rather sudden and wide spread of similar dates about 1 million years ago across parts of Europe suggests that the first settlement of Europe probably occurred not much earlier that, but what is unclear is whether the hominins arrived into western Europe via Africa or Asia. Unfortunately, the Mode 1 stone tool kits of African and Asian are similar, and therefore cannot be used to distinguish them. Along with their relatively simple and homogenous stone tool kit, these hominins did not control fire and therefore they ate their hunted prey raw, and it is argued that they also practised gastronomic cannibalism; that is, cannibalism where human flesh is processed and eaten without ceremony other than culinary, in a similar manner as the flesh of other animals. Vallparadís is a Lower Pleistocene site discovered along the Vallparadís River in Terassa during the building of a new train station. Here stone tools and faunal remains were found in an ancient floodplain, with one of the archaeological layers dated to 830,000 BP (before present). The stone tools were formed – using a bipolar-on-anvil technique- primarily on locally sourced quartz, with a range of other raw materials used, all of which may have been sourced locally. The tool types includes notches, denticulates, becs, and choppers, which Martínez et al. note are all characteristic of Mode 1 (Oladowan-like) sites. Faunal remains included deer (Pseudodama vallonetensis and Premegaceros verticornis), boar (Sus cf. scrofa), horse (Equus altiadens), bison (Bison sp. ), rhinoceros (Stephanorhinus hundsaheimensis), hippopotamus (Hippopotamus antiquus), and elephant (Elephas antiquus) amongst others, with evidence for cut marks along with carnivore bite marks on some bones, which is evidence that the hominins were in competition with other carnivores for the same prey. However, it could not be discerned if the hominins or the carnivores had left the marks first. At the site there is also evidence for jaguar (Panthera gombasgaoezensis), Lynx (Lynx sp), wolf (Canis mosbachensis), bear (Ursus deningeri), and hyena (Martínez et al., 2010). The pollen analysis showed that at the time the hominins were occupying an open landscape, and the flora suggests a temperate, subarid, Mediterranean climate. Unlike later sites, the hominins did not appear to focus on marrow extraction at the site; this lack of interest here and at other sites in Eurasia and Europe has been taken as evidence for a lack of scavenging by the hominins, i.e. the meat alone was sufficient. 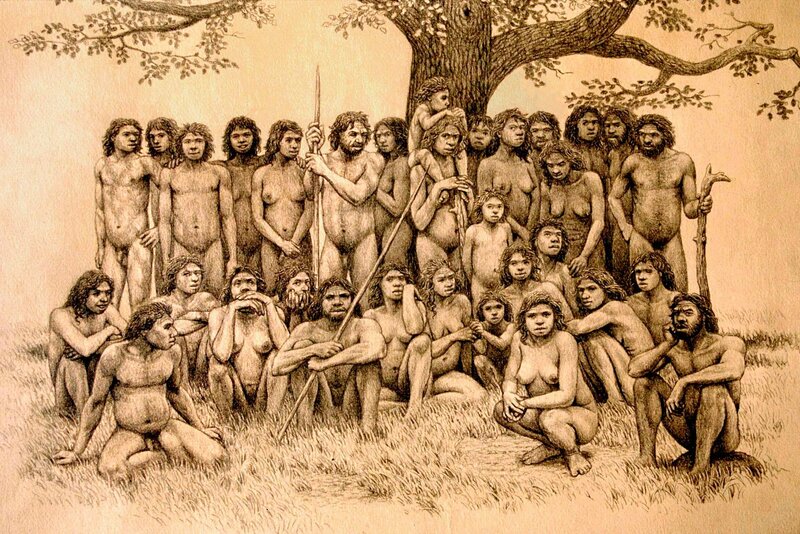 The hominin groups were able to use a rich biological environment and were able hunt to a range of prey, and used a wide range of raw materials. 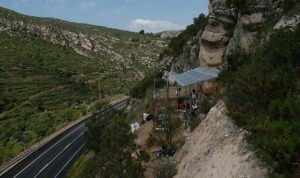 At Barranc de la Boella a few km southeast of Tarragona, recent research has put into context a site that was first noted a century ago. Since 2007, excavations have taken place in three adjoining sites in an area that was at the time of occupation by hominins a fluvio-deltaic part of the Francolí River system. Here, palaeomagnetic and cosmogenic analyses have dated hominin activity to within the late Early Pleistocene between 0.96–0.78 Ma. In Pit 1 the excavators uncovered a mammoth butchering site in an area that would have been a swampy area of the Francolí river basin. The butchering site had been covered by sediments quite quickly after the event, which preserved the animal bones and stone tools in situ (in place), leaving a remarkable glimpse into the deep past of almost one million years ago. The mammoth (Mammuthus meridionalis) was an adult, with cutmarks along the ribs showing evidence of defleshing by the hominins using stone tools. The stone tool kit found by the mammoth comprised 125 artefacts – 10 hammerstones / percussion material, a large schist pick, and a range of cores and flakes including 8 retouched flakes. The cores and flakes were made from at least nine different ‘types’ of chert. From the refitting of the stone tools, the excavaators argue that the hominins undertook in situ knapping and retouching for some of the material, while others were brought to the site by them pre-made. Use wear showed evidence for cutting on most of the flakes tested. While there is clear evidence for hominin defleshing of the mammoth, the cause of death of the animal is uncertain, with proposed three possibilities – the first that the mammoth died of natural causes and the hominins then scavenged it, along with other predators. The second, that the hominins had hunted and killed it, with the excavators noting that the hominin groups of the European Early Pleistocene were expert hunters, as documented in the TD6 level of Gran Dolina, Atapuerca. And the third, that the large animal had become stuck in the swamp, which is a common occurrence in such environments. At La Mina, a range of stone tools and faunal remains found, with the stone tool raw materials similar to Pit 1, and similar tool types but also included chopper cores. At el Forn, about 200m from La Mina and 10m from Pit 1, again a similar range of tools from similar materials were found along with faunal remains, and here a large cleaver-like schist tool was found. Taken together, the three locations at Barranc de la Boella have provided evidence for the earliest appearance of the Acheulean in Europe in the Early Pleistocene, typified by the schist pick and cleaver. The researchers suggest that the stone tool assemblage is similar to other Mode 1 assemblages from Atapuerca-TD6, Barranco León, but the pick and cleaver mark a major change not seen in those two assemblages; they suggest that their appearance at the Barranc de la Boella Acheulean may represent a local invention, or alternatively, it “may have come from the Near East or Africa, given its Mediterranean location and the scarcity of sites (demography) at that time to ensure cultural contact and local evolution” (Mosquera et al., 2016). Upstream along the Francolí River is la Cansaladeta, a Lower Palaeolithic site located in the Roixeles canyon, a natural pass in the Pre-littoral Catalan mountain range connecting the Tarragona coastal plain with the Ebro basin. The site is located by a rock shelter along a Palaeolithic fluvial terrace, about 50 m above the present day river. First discovered in 1998, excavations have uncovered a Middle Pleistocene site with the middle levels dating to between 370 and 400 ka, and, based on the faunal evidence, the lower levels may be from the early Middle Pleistocene (c. 600 ka). This date of after 500 ka suggests, therefore, that the hominins here at that stage were communities of Homo heidelbergensis. The assemblage contains mostly stone tools, with less faunal evidence. The materials used – dominated by chert – can all be found locally, and the assemblage represents an Acheulean Mode 2 with characteristic large tools such as cleavers and picks, but with few retouched flakes. The faunal remains point to the hominins having exploited resources either from open (horse and rhinoceros) and wooded (deer) environments. While no hearths were discovered during the excavation, the evidence of microcharcoals, and burnt lithics and bones throughout the levels point to the use of fire by the hominins. Mollet I is one of a series of small caves formed along a travertine ridge overlooking the Serinyadell stream close to the foothills of the pre-Pyrenees, about 30 km north of Girona. These caves, formed from travertine cascades are known as the Reclau Caves and form part of the present day Serinyà Prehistoric Cave Park, and include Arbreda Cave and Reclau Viver Cave. The earliest date for hominin presence in the cave series are from Mollet I, where a tooth from a hominin – possibly Homo heidelbergensis or Homo neanderthalensis – was found and dated to 215,000 ya. Mollet I Cave was excavated intermittently from 1947 to the early 1970s, and once again from 2001-2005. These excavations of the small cave have provided evidence for burials during the Chalcolithic / Bronze Age, along with Upper Palaeolithic and earlier Neanderthal activity. 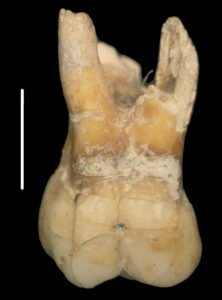 The hominin activity from Layer 5 dated to about 215,000 years ago is not very abundant, with the layer containing some stone tools and burnt travertine rock, along with the one identified tooth of a hominin child. The majority of the layer is faunal remains, and it is interpreted that the cave would have functioned at the time as a den for carnivores, especially spotted hyena, of which there are abundant remains. At the time of the deposition of the hominin tooth in the cave, the area was in a warm period, the MIS 7, more specifically the MIS 7c substage, which indicates that the occupation by hominins took place during a warm to a cold transitional phase with forest development. The faunal remains suggest a mosaic of ecotopes in the area including open humid meadow, open dry meadow, woodland, and water edge. The researchers note that the strategic position of the Reclau Caves would have attracted both hyenas and hominins, as it was a migration route for large mammals such as horse, rhinoceros, deer, fallow deer and aurochs that moved between the south of France and the depressions of the Catalan System. 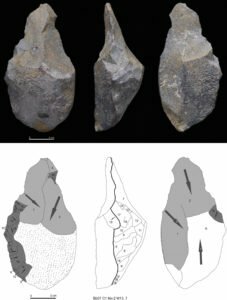 The largest grouping of Lower Palaeolithic material in Catalonia has come from around Girona, especially focused along the River Ter and its tributary, the Onyar. Here, a range of open air sites along river terraces including Mas d’en Galí, Costa Roja, and Puig d’en Roca have produced evidence for early type tools (Mode 1) such as choppers and simple retouched flakes formed on local quartz, along with some non-local quartzite and porphyry. This area also produced evidence for Mode 2 and Mode 3 type assemblages, suggesting a very long chronology of hominin occupation in the region. Recently, a dating programme on the river terraces was undertaken on the sites, which has provided an overall chronology for the river terraces. This has demonstrated that between 300 and 100 kyr (thousand yeas ago) there was a transition between Modes 2 and 3 in the region, with the Mode 1 types occurring before 300,000 years ago but with use of such types persisting. The ESR-US (electron spin resonance-uranium series) age of a horse tooth (EVT0601) from Level 10 is about 0.83 ± 0.07 Ma (million years ago). Duval et al. undertook another series of ESR dates on teeth from the site, with the weighted mean ESR age estimates of 858 ± 87 ka and 849 ± 48 ka (thousand years ago) for two of various levels with archaeological material. The Uranium-series radiometric data for the layer with the hominin tooth was 215,092 + 12,926/-11,668. Carbonell, E., Rodríguez, X.P., 2011. El Paleolítico inferior en Cataluña. Veleia 24–25, 331–343.